The Bengal florican (Houbaropsis bengalensis) is one of the most endangered (IUCN) grassland birds with a world population of 1500 individuals. Its populations have declined as a result of habitat loss and hunting and in the Indian subcontinent. 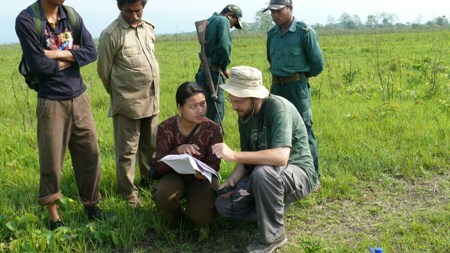 In India, Manas National Park of BTAD has always been a stronghold for the species. The main aim of this study is to find out present population status of florican in BTAD and its future conservation approach involving different stakeholders. Survey will be done at its peak breeding season, central point of each displaying male will be taken by GPS and a GIS map of its distribution will be prepared. The outcome of the study will help the state government and other conservation agencies to address the critical issue related to Bengal florican conservation and its habitat management.